On Thursday 5 December, the Chancellor of the Exchequer will be making his Autumn Statement to Parliament. It’s a significant event, around which several of us may be publishing content. So here’s a quick guide to help us all join up our coverage. The Chancellor will give his Autumn Statement speech to the House of Commons at around 11.15 on Thursday 5 December. Nothing should be published until he finishes his speech - typically, around one hour later. Here are four things to bear in mind if you’re expecting to publish content, such as publications, around the Statement. 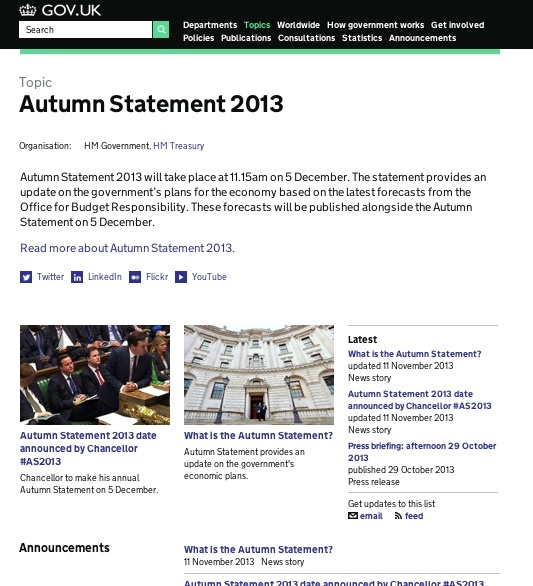 HM Treasury, as the lead organisation on this event, will be curating an Autumn Statement 2013 topical event landing page on GOV.UK. The page will bring information together from across government and will, we hope, deliver a marked improvement in the way we join up our coverage for users. It will be the main destination we promote (at www.gov.uk/autumnstatement2013), and optimise on search. You must tag any content you create around the Autumn Statement to this topical event. This will help users find all relevant information in one place. Avoid creating additional departmental news stories about the Statement. By default, if you’re publishing any content on the Autumn Statement, you should add a callout within your page promoting the topical event page. Like this page does. 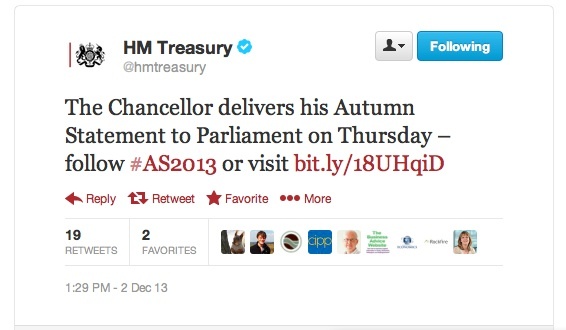 HM Treasury are tweeting to promote the Autumn Statement landing page. If appropriate, please RT from your department’s social media account. HMT’s digital team will be keeping an eye on how Autumn Statement content is performing as a whole, checking we’re optimising to the right keywords, and making sure the main user journeys are working well. We’ll let you know if there’s anything we reckon you could do differently to help users find the information they need. If you have any questions, the best contact point at HM Treasury is Kylie Clark. For urgent technical assistance with publishing on the day, please use our emergency contact procedures as outlined in this blog post.